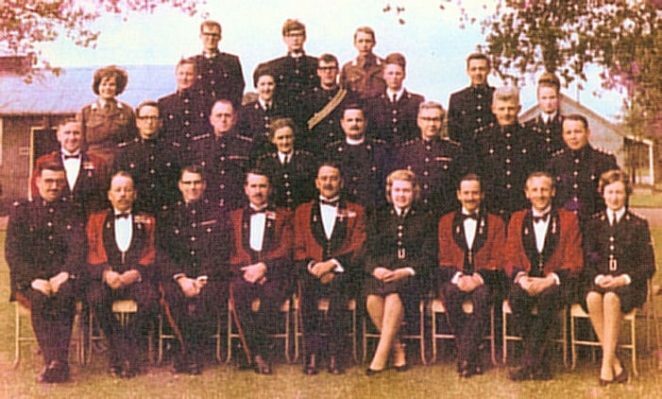 Whilst senior officials like the Colonel, PSI (permanent staff instructor) and Whittington the regimental clerk were fully employed by the army, the rest of us were part time local volunteers. Many officers came from local or city banks or insurance companies, and names like Truphet, Cardy, Hall, Gundry, Boocock and Upton come to mind. Local Warrant officers and sergeants included Barham, Bartlet, Hunt, Gravenor, Hooper and a cook called Pesket who could produce an amazing 5 star meal from a field kitchen dug into a hole in the ground. Then there was the gang of five, myself, Lander, Fleming, Burchfield and Vardy, who were eventually broken up by our respective promotions and the final reorganisation of the TA itself. Provided you could accept the discipline, commitment and the ribald remarks of neighbours and former regular soldiers, it was almost a social club, for drills were followed by time spent at the bar which only had to make 10% on cost. Furthermore, we had the opportunity to attend two paid weekends away each month, and every year did a fortnightly camp in the UK or in Germany. Some firms (not mine unfortunately) thought the TA so character building they even gave volunteers in their employ paid leave, so they got a double financial whammy. I personally recall being landed by an LCT (tank landing craft) onto a Jersey beach and having to pretend to be an enemy agent. I avoided being captured so well by loosing myself amongst a group of rugby club revellers, that I eventually had to give myself up otherwise I would have missed the return transport and would not have been back for work on the following Monday. Introduction to the man’s life? My six years at the TA Centre at Brighton’s Preston Barracks were theoretically supposed to be my introduction to the man’s life I was missing because compulsory National Service had been discontinued, but there were times when the small boy still in me felt once or twice a week, that he had been deposited into a toyshop and allowed to run riot, whilst someone else was picking up the tab.